Peter Hoey: Growing up, the only comics I read were in the newspaper, The Philadelphia Bulletin. When I was in art school in the late 1970s I discovered Art Spiegelman’s Raw Magazine. That exposed me to a whole world of comics that I’d never seen before. After that, it was Weirdo and onto Zap, Bijou and all the mini-comics being published in the 1980s. I was hooked. Maria Hoey: Each morning I read the comics in the Philadelphia Inquirer – The Bulletin had closed by then – and the Mini Pages on Sundays. We were a big family and our books mostly came from the library. I would, however, buy MAD at the pharmacy (in order to see the Fold-In you had to crease the back cover). So when we started making comics together I think we approached it without a lot of preconceptions or constraints of what a comic should be and we just blended in everything we love. Because, why not. Peter: In 1997 I was working as a freelance illustrator. It was lonely working alone so I asked Maria to join me after she graduated from school. We named our studio “Coin-Op” after moving to San Francisco in 1998. There were Coin-Op laundries on every corner in my neighborhood and the name stuck. Maria: The Coin-Op Laundry signage around San Francisco just popped out to both of us. Usually spelled out in faded plastic lettering but still beautiful. And “Coin-Op” is so perfect. Automated, mechanical, and very American. Monte writes in the book about this, but Peter I wonder if you could say a little more about how and why you started contributing to Blab? Peter: Monte rang me up one day and asked me if i’d like to do a comic for his Blab magazine. He had seen some of my illustrations and thought I could be a comic artist. It had never occurred to me that I could do a comic and I explained to Monte that I had no idea how to write one or how to lay it out. He laughed and said I should just try it, so i did. By that time, Maria was working with me so we did them together. Peter: We work up the idea first, trading it back and forth until it’s something like a coherent story, I do pencil sketches and generally do the line work. Maria does the coloring and textural elements but we continue trading the pages back and forth until we’re sure it’s done. What made you start publishing issues of Coin-Op comics? Peter: We had been doing comics for Blab! and when the magazine went on hiatus in 2008 we head a lot of ideas and nowhere to publish them. More or less on a whim we decided to start publishing our own books. Maria: It seemed like a natural progression. Working as illustrators, we had a good understanding of production – so how hard could it be to put out our own book?! Once that first box arrives from the printer with that wonderful inky smell, we were hooked. Peter: We were already calling our studio “Coin-Op” so it seemed natural to use that name for the books as well. Maria: Our last name, Hoey ( pronounced Hoy) is forever being mispronounced. Coin-Op is nicer on the ears. 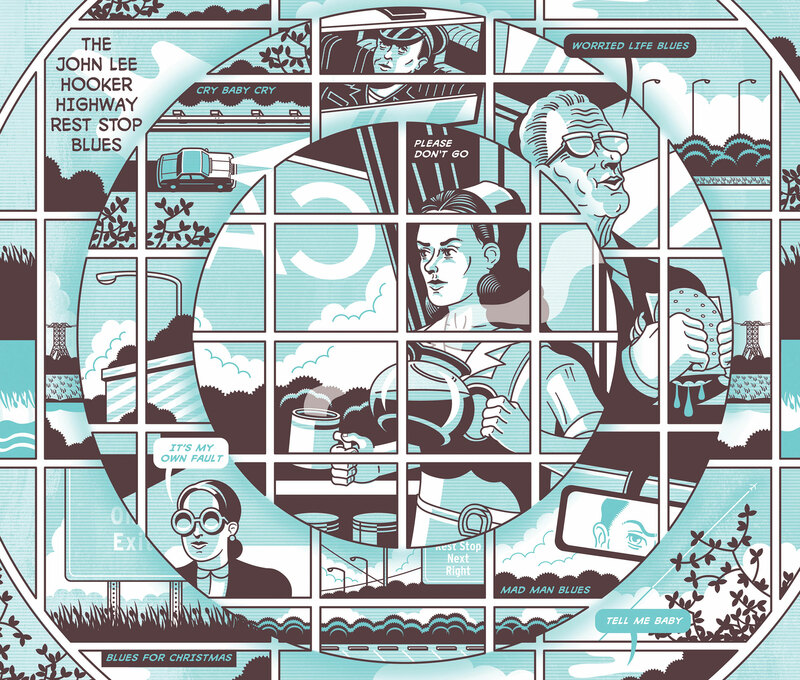 Reading the book it feels like every time you sit down to make a new comic, you’re very consciously trying to think of a different way to tell the story and compose the page. I often ask artists when we talk to walk me through how they work, but given that your comics tend to be so different, I wonder if you talk a little about design and thinking about the page and laying out space. Peter: We try to make every story visually unique. 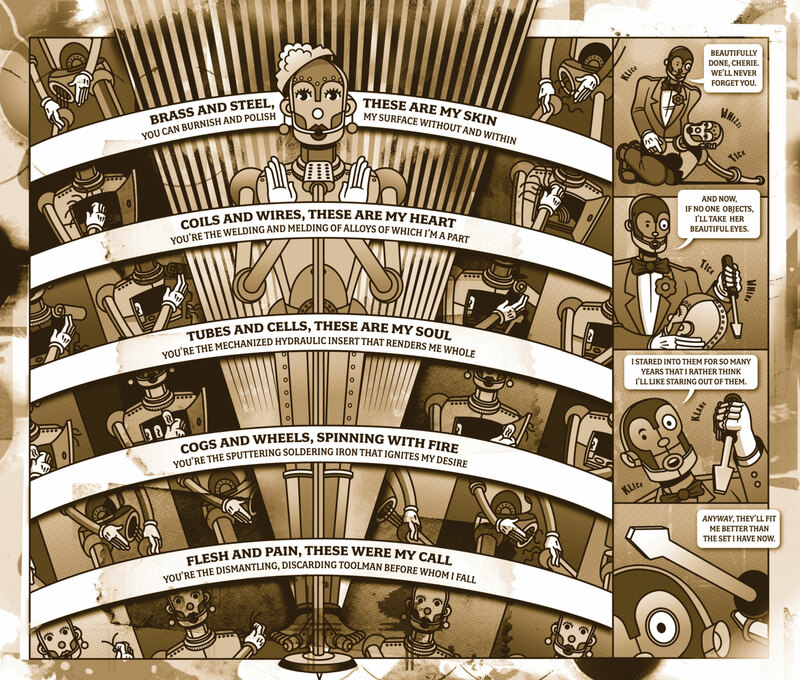 Our books tend to be collections of comic short stories, so setting them apart from each other makes it more interesting to look at. Maria: Each story is its own world and an opportunity to experiment with the presentation. Again, since we weren’t baptized early into the life of comics, our references come from other places (film, music, art and illustration) so playing with the idea of panels and type is a natural – and freeing – way for us to work. It still has to work as a comic, but I don’t feel that it has to be always a gridded page of panels in order to tell a story. 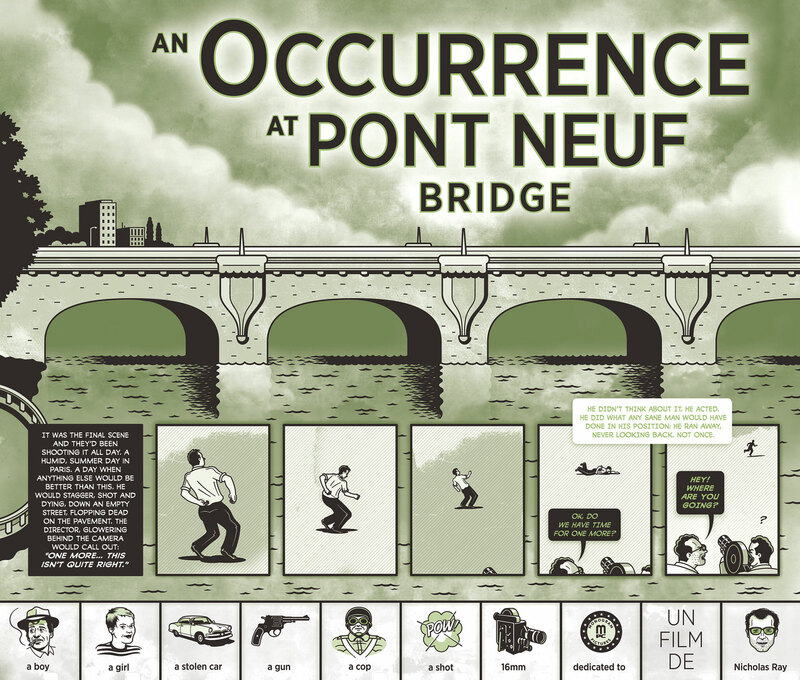 The comics police aren’t going to arrest us for going wild with a page design. Maria you’ve made some comics solo and they have a different aesthetic. I wonder if you could talk a little about the pieces you did. 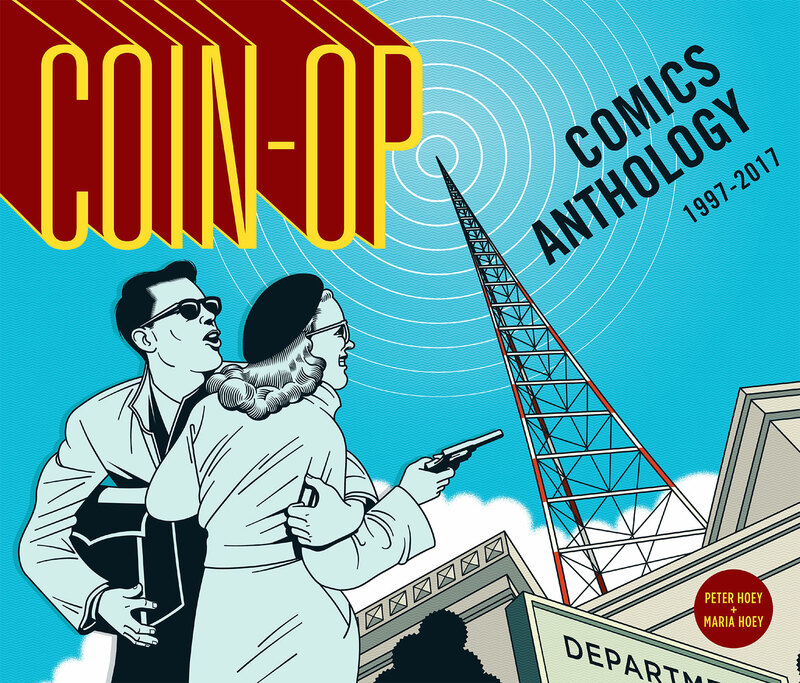 Maria: Our Coin-Op series is a collection of multiple stories. Much like a mixed tape or playlist, a collection of shorts needs good flow. The pages I made are a little more abstract. A visual pause in the issue. In our later issues we created spreads – Ida Lupino, and Other Self – to function in the same way. Can you talk a little about Saltz and Pepz, who I really love. Where did these two characters and this concept come from? 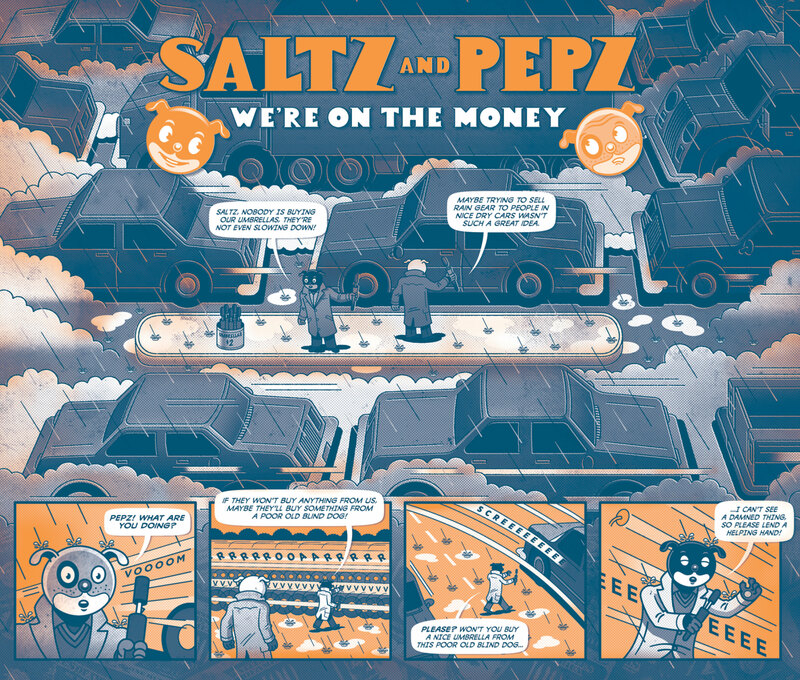 Peter: Saltz and Pepz started as two character voices that Maria and I made up for our own amusement. Gradually they took on their own characteristics and foibles. By the time we started drawing them, they were fully formed in our imaginations. We grew up parked in front of the television and the Fleischer Brother cartoons were favorites. We tried to give our characters a little of that street-wise attitude. Maria: Saltz and Pepz are born to lose, but they always give it their best shot. I love how their stories work within our issues too– giving the reader a nice cartoony break. Why did you decide to arrange the book starting with your most recent work and going backwards? Peter: It seemed natural to do it that way. Maria: Ditto. It was a very simple twist at organizing the book and hopefully has the effect of keeping the reader entertained. I’m curious, for you what connects these stories? Or do you even see a throughline in them? Peter: All our stories contain bits of our own experiences and interests. When we put them into story form it’s important to us that the feelings remain. Then it feels complete. Maria: Visually, each story is unmistakably ours. That’s the thread that runs through them and makes them Coin-Op.